April 05, 2019: The Board of Secondary Education, Rajasthan conducts the Rajasthan Board class 10 exams every year. This year, the Rajasthan Board exams 2019 for class 10 will be conducted from 14 March to 27 March. The entire time table for RBSE class 10 can be found here. The Rajasthan Board class 10 results for the year 2017-18 were announced in the month of June, on 11th of June. Keep an eye on www.examresults.net/rajasthan/ to get the exact RBSE 10th result 2019 time and date along with other important details like pass percentage, topper marks etc. How to Check Rajasthan Ajmer Board 10th RBSE Result 2019? Look for the desired board button, for example the button that says RBSE 10th Results 2019 Click Here. Click on the link and fill in your details, including Registration Number and Date of Birth, to get your Rajasthan Board 10th Result 2019. Take print out of your Class 10th RBSE Result 2019 score card. 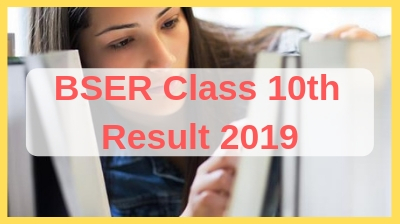 Students can check this RBSE 10th result 2019 not only on this website and the official Rajasthan board site but also on our free Android App which can be downloaded from Google Play store. The Rajasthan Board exams for class 10 were conducted between 15-26 March, 2018 and the Rajasthan 10th Board results 2019 were declared on 11 June, 2018. The overall pass percentage was 79.86% and around 11 lakhs candidates appeared for the exam. The pass percentage for Rajasthan Board exams for class 10 in the year 2016 was 92.73%. However, the overall pass percentage dipped in 2017 to 78.96%. A difference of 14% can be seen year over year from the table below. The number of students to appear for the exams has increased from 2016 to 2017. Where Can You Check Your RBSE 10th Exams Result? You can check your BSER class 10 Results 2019 on www.examresults.net website and also the official website of Rajasthan Board- rajeduboard.nic.in / rajresults.nic.in. Download the Android App, ExamResults and check your Rajasthan board results on your phone. BSER or the Board of Secondary Education, Rajasthan was established in the year 1957 on December 4th. A lot of government and private schools are affiliated to this Board. The headquarters of RBSE are located in Ajmer, Rajasthan. The Board of Secondary Education, Rajasthan organizes and manages the entire school level education, i.e. Class 1st to 12th in both Hindi and English. The students can check their result on the official website (rajeduboard.nic.in / rajresults.nic.in) of BSER.